When using our on-line ordering service, please note that we send all orders received via Australia Post and can post to anywhere in Australia. Our aim is to dispatch orders within 2-3 business days however please allow up to 14 days as delivery time can vary dependent on your location. Customer satisfaction is important to us and we ask that you examine all packages immediately upon receipt. If defective or incorrect merchandise is received, you MUST notify us by email within 7 days of receipt. Patchwork Place cannot accept returns if you have changed your mind. If, however goods are faulty, we will allow you to return the goods for a refund, replacement (depending on availability) or exchange to the same value. Refunds will be processed through the respective credit card companies once the items are returned to us. All returned items must be returned unused and in the same condition as sold along with your customer receipt (original or photocopy). Please ensure goods are repackaged securely, as we cannot offer refunds for goods that are damaged in transit. You are required to return the products by post and keep the postal receipt. 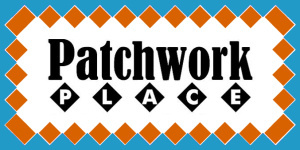 Patchwork Place will refund your postage for goods that are faulty, but will not accept the return of goods C.O.D. Cut fabric, books and patterns are non-returnable.